April 20 Sunday Pleasant, tho' breezy, all well as usual here at George's tho' rather late up. After breakfast I went over home, attended B_ church, with Ellery, he & I took dinner at home, also spent PM there, but here at Rose's to tea, & I'm spending eve here, not feeling quite well enough to attend church with the rest. 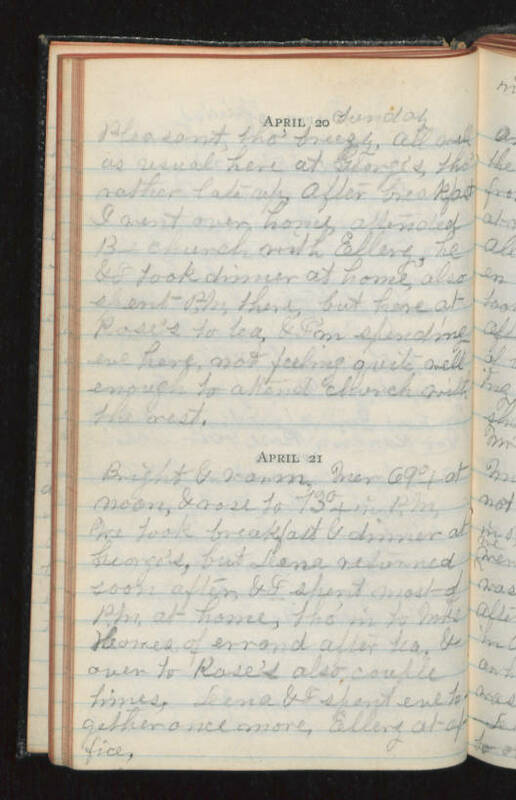 April 21 Bright & warm, Mer 69°+ at noon, & rose to 73°+ in PM We took breakfast & dinner at George's but Lena returned soon after & I spent most of PM at home, tho' in to Mrs Howe's of errand after tea, & over to Rose's also couple times, Lena and I spent eve together once more, Ellery at office.